Compare Gabriel’s response to Mary’s question and his response to Zechariah’s question in Luke 1:18-20. Why and how do you think Gabriel concluded from Zechariah’s question that Zechariah did not believe Gabriel’s words, but Mary did believe Gabriel’s words to her? Why do you think Gabriel told Mary about Elizabeth’s pregnancy? Can you identify any words in Scripture that you need to write down or memorize so that you remember “no word from God will ever fail”? What words? How do you think you would have responded if you were Mary to Gabriel’s description of what was going to happen to her? What does her response reveal about her? Father, help me to believe your words, those you speak in Scripture and those you whisper into my heart. When I doubt you, your goodness, your love, your presence, remind me of the ways you have blessed me, loved me, and revealed yourself to me in the past. Help me to respond to you the way Mary did. 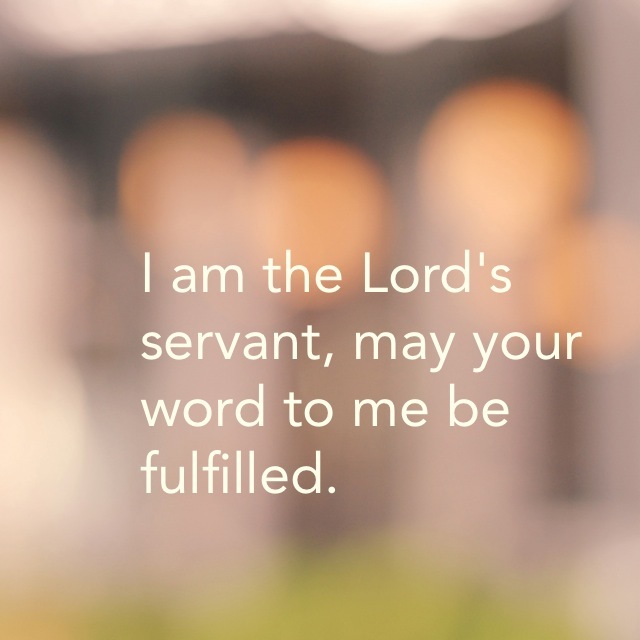 After all, I too am your servant, and I pray that the words you speak to me are fulfilled, whether they seem impossible, difficult to believe, or contrary to my desires. Thank you for this devotions. We too are going through the book of Luke for our devotions at home. Keep the fire burning. Thanks, Lawrence! I loved your Monday issue that you just sent. It was beautiful. Blessings!